This week, our task is to experiment with and analyze one of Jane Hart’s “Top Tools for Learning 2016.” Considering the tool from both a technical perspective, as well as from a leadership and organizational perspective, this post will discuss both the pros and cons of integrating Clarify into one’s digital toolbox. 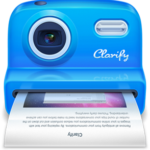 Clarify is a screenshot generation and management tool. The application is designed to streamline the process of taking screenshots of your computer and compiling them into a format that can be useful for training, client presentations, customer service, or any number of other applications. The app consists of the screenshot engine, which allows you to simply drag your cursor over a section of your screen to capture the content into an image format. Once you have the capture, Clarify lets you add formatted text, annotations, highlighting graphics, and links. (This document was created through Clarify). I went to clarify-it.com to download the app. Super simple, attractive site, that was easy to navigate and quick to download. A tool like Clarify can be extremely helpful in an organizational setting. The application allows you to create documents that can help you communicate policy and/or procedure. Implementing new practices in an organization can be very difficult for many reasons. Providing clear, accurate, and attractive documentation can help leaders and change managers improve adoption rates and reduce employee (or customer) frustrations! They say that a picture is worth a thousand words, and in this case, a picture (screenshot) may help organizations save time and money in the development of their training, policy, or technical support documentation. A few years ago, my team was consulting a retail outlet that sold locally-made products from vendors across the state. They sold items mostly on consignment, though some were done wholesale. We recognized that the retail floor staff was bogged down with managing vendors rather than selling product and interfacing with customers. With 100+ vendors looking for payments, sales numbers, and inventory counts, things were getting out of control. We devised a web-based vendor portal that would allow individual vendors to log in and see all of their data in (nearly) real time. The portal connected to the store’s point-of-sale terminal system and updated the data approximately every 6 hours or so. It would alert vendors about low inventory, and provided numerous customizable reports such as monthly sales, most popular products, trend maps, and so forth. I developed an internal training document for all retail staff that included step-by-step instructions for many different functions. Given the wide range of technical expertise on the staff, the document had to be clear, concise, and VISUAL! Thus, it contained screenshots of nearly every section of the portal, with annotations, highlights, and special instructions or tips. Clarify would have been an ideal tool to use! Similarly, I created a user guide that was distributed to all vendors along with their portal credentials. In this case, it was very important for us to brand the organization. May vendors sold products at many other locations around the state. We wanted to make sure that we were distancing ourselves from the competitors, and did so by creating a positive brand association with this cutting edge tool (that no other retailer offered). For this initiative, Clarify would not have been sufficient, as it does not have the depth of customization and control that I needed. Do I really need/want this tool? I’m always hesitant to download more third-party apps because I’ve found that more often than not, they do not provide a significantly better solution than either built in OS tools or tools I’m already using. For me personally, apps like Clarify take time to learn, time to build a habit around, and seem unnecessarily disruptive to my process. I believe this is a biased opinion because of my professional experience and knowledge using titles like Photoshop and other image manipulation/presentation/training tools. In order to create, for example, a simple tutorial for a client on editing their website, I would do the following. Take screenshots using Mac’s build in capture utility (Cmd+Shift+4 from ANYWHERE within Mac OS). If it’s a simple demonstration of what something looks like or which button to press, I would drop it in an email and add formatting, bullets, numbered lists, etc. In general, I would prefer to use screenshots embedded in an email rather than creating entirely separate documents, but I can see the benefit of the latter, especially in illustrating long or complex processes. I am a firm believer in reducing digital bloat by way of fewer apps, generating fewer unnecessary documents, and taking fewer steps in my processes. In the example above, I would rather not complicate things for myself or my client by creating another document that we both have to save. I can accomplish almost anything I can do in Word (for example) in my email client. Now, that information is stored in the cloud, accessible via multiple email clients, and perhaps more collaborative. We don’t conflate the issue with software compatibility questions, firewall attachment restrictions, filesize limitations, or untrustworthy formatting. However, as I mention above, email may not be suitable for creating long or complex documents from your screenshots. If this is the case, and the client/customer need warrants the creation of a new document, I would want to have a lot of control and flexibility over customizing the document. Clarify documents are saved with a *.clarify file extension, making them unusable from any other application. The PDF export option does the same, but offers 4 formatting options. (Example 2). For me, this is moderately useful. 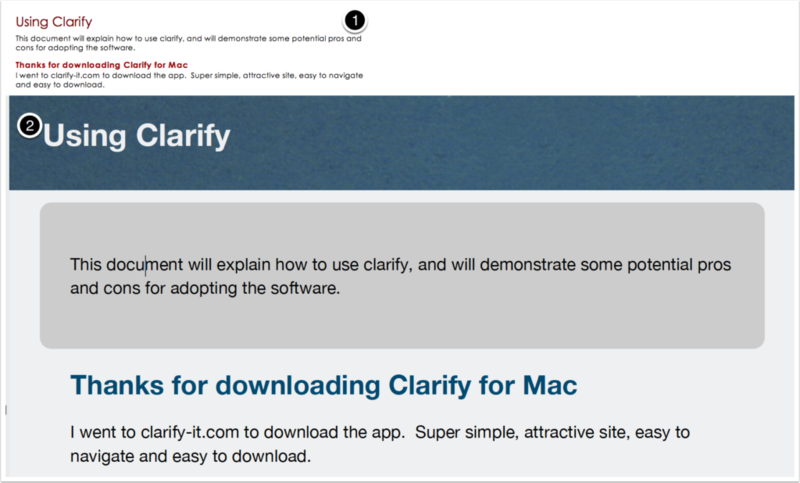 Clarify allows for some customization through the onboard PDF template generator. You can add a logo and specify fonts, colors, page sizes, margins, etc. You can apparently build your own custom HTML templates! This process is terribly complicated. In my opinion, if you can follow these steps, you could probably build your own HTML pages from scratch, again using existing tools. Yes, in a large organization, an IT specialist or instructional designer could setup these templates for less tech-savvy content creators for publishing on an intranet, for example. To make the most use of an HTML output, you’d want to post it to a web server, which you cannot do natively from within the app. Thus, you have to have a separate FTP client and available web server. Preferences: Clarify offers some customizations for things like user interface and export options. Sharing to the above services requires several steps of setup and authorization. Publishing to Evernote seems redundant. Sharing the .clarify file on Dropbox means that your collaborators need the Clarify app as well. WordPress sharing options are limited and seem to be complicated by many technical issues associated with publishing to the web (image uploads, permissions, updating, WordPress cache and image management). In conclusion, I will not be adopting this tool into my regular workflow. For some individuals and organizations, Clarify may provide a quick and easy way to share annotated screenshots. However, I would caution leaders against trying to force the adoption of this system. As illustrated above, the features of this program are well covered by other existing programs and utilities. The benefits found in Clarify’s convenient packaging, in my opinion, are not sufficient for the effort that might be required to spread adoption. Author, Didier Bonnet, in a 2015 article at Harvard Business Review, was quoted as stating that poor communication about the (comparative) benefits of a new tool is key to ensuring adoption in organizations: “Employees need to understand why [the new technology] is an improvement from what they had before” (Knight, 2015). In the case of Clarify, I’m not entirely convinced that the solution is better than what I had before. I would be hard pressed to champion the adoption of this tool in my organization. It’s also not the type of tool that would necessitate organization-wide adoption. As a piece of software, it’s a fine application. Easy to use, fast, and very niche in purpose. It does what it sets out to do. That problem Clarify solves, however, may not need to be tackled with yet another app on your hard drive. Good review, James.I would suggest that few have the graphic design chops or the HTML chops that you do, and might find a tool like this helpful. I do most of my work in the PC environment, and thus use SnagIt to capture pieces of the screen (which show up in my class videos, done in Camtasia). There is rarely one tool that does it all, so I focus on the process and try to come up with the best workarounds. What I find encouraging is that numerous “solutions” do tend to exist. Clarify is new to the Top Tools list…be interesting to see if it lasts. Tools come and go, IFTTT and Softchalk were listed in 2015 but fell off the list in 2016. Did you find anything on whether accessibility screen readers for visually impaired individuals could read a Clarify document? I was definitely trying to recognize my professional bias in reviewing this tool. When you use systems all day, every day, you learn a variety of ways to get from point A to point B. I would liken this to one’s command of English in writing blog posts or papers for Doctoral coursework. The more you do it, the more nuance you have at your disposal. I agree about the rapid comings and goings of tools. I think that’s part of my reticence. I think that the trend to create highly specialized apps with relatively minor comparative advantages is hurting adoption and staying power. That is, with so many to choose from, organizations may be crippled in their decisions about tools. As you said, there’s no tool that does it all, so if you can get 85% of the way there, great – let’s just pick one. Focus on processes, and allow creators to use the tools that make them most productive. Re: accessibility… The formats that are exported (HTML, .doc/x, PDF) are created with live, editable text that’s readable through OS accessibility tools. The HTML documents (and others as far as I can determine) do not publish any ALT tags or meta information on the captured images, so that content would not get picked up by accessibility software. The *.clarify format (within the app) does not appear to be reader-friendly. I’m not 100% sure on all the available accessibility options, but neither Voiceover or Speech for Mac picked up on Clarify content. Great question and a potentially important decision point for an organization. Great review! I especially liked that you used Clarify in creating your post. Being able to publish a Clarify document as a WordPress post is a nice feature. You make an excellent point about comparing the value-add of a new product with what is already in place. It sounds like Clarify automates a workflow that can be accomplished with tools like Grab, Safari, and Word. Given Clarify’s cost of $30 I recommend taking a look at Snagit (my blog topic this week) for $50. In addition to screen captures and simple graphics, Snagit makes screen capture videos, which brings added value. As Dr. Watwood mentioned, it will be interesting to see if Clarify stays on the Top Tools list. Hi CatonKB – thanks for the additional recommendation about Snagit. I think there’s a MAJOR difference in the ability to capture video. I think my beef with Clarify is that it doesn’t really add value beyond what could be accomplished in Microsoft Word… and even if you don’t have Word, you could use free versions of Open Office or Google Docs. Video screencaptures, on the other hand are more unique and do add tremendous value! I read your post this week directly after reading the one from CatontheKeyboard. It was nice to be able to compare and contrast the two products as they do appear to have some similar features. I must say, I tend to lean in the way you do when it comes to these types of applications. My organization struggles with how to respond when an administrator or dean comes to us with newest and greatest of third party applications. I certainly see the benefits of Clarify using your thorough review of the product, but would probably respond in the same way that it is not necessary for my college – particularly at the costs you mentioned. As I read through your product description, I was walking through how the capture features could be accomplished in Word and the sharing could be done in Google Drive (we are a fully integrated Google institution). As a heavily tuition-dependent college, we must look for ways to better utilize the tools that we have an increase efficiency. Therefore, I would likely not recommend the use of Clarify at my school. I do appreciate the reivew you provided. Thanks! Fiscal responsibility is an important part of this discussion, I agree. I also think it’s important to consider the collaborative aspects of this, as you point out with your institution’s Google Integration. Throwing another tool into the mix could disrupt the workflow and create unnecessary compatibility hiccups. Google’s done such an incredible job of putting the pieces together for real, efficient collaboration, and if that’s a part of the technology fabric at your organization, you should use it as deeply as you can! James, thank you for your review. In many ways, I will echo you, as well as those already commenting. You addressed the first question I would have asked in your initial post in explaining how Clarify is perhaps more straightforward but not necessary better than preexisting tools or combinations thereof. Particularly, when there is a purchase cost. I work interchangeably on a Mac and a PC, so I am familiar with the Mac shortcut and “print screen” on the PC. I have leveraged these options happily for many years in combination with Word or Paint. My organization recently licensed Snagit for all of us communicators, and I struggle to find the value beyond what I could already do. Snagit hijacked my “print screen,” so I do use it. And since we were not anywhere near Photoshop level functionality with the Microsoft Paint option, I know the business decision for Snagit could not be that others could not use what we had. However, it was probably easier to just give everyone one, new tool rather than explain how to use a combination of what was already installed on our computers. What are your thoughts on ease of organization-wide deployment and adoption as a reason for tech tool proliferation? Similar perhaps to Facebook’s initial strategy getting in with universities, which in part allowed it to succeed over preexisting tools like MySpace (Kagan, 2014)? Great question, Julie. In my opinion, there’s two sides to this coin. The first is that the IT team has to deploy and support the software. How it needs to /can be configured will impact the complexity of deployment. In the case of Clarify, there is some customization work that needs to be done in order to get the right kinds of output. Further, the user would need to plug into individual external accounts which may cause security concerns. It seems that from this side, the complexity of deployment vis-a-vis relative advantage is prohibitive to adoption. Here, I think IT functions as a change champion (or not).